Boston’s most imaginative new music ensemble presents premieres of works by some of the most enterprising young composing talents of our time. 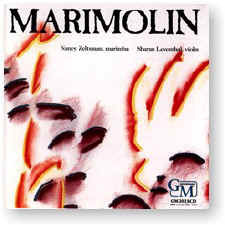 Marimolin draws from such diverse areas as jazz, serialism and Indian music. Recorded on (#1-7) 17 December 1987 and 4 January 1988 at Houghton Chapel at Wellesley College in Wellesley, Massachusetts; (#8) 12-14 July and 12-14 August 1988 at Downtown Recorders in Boston, Massachusetts.